We arrive in the roof top meditation room of the Varja Hotel. 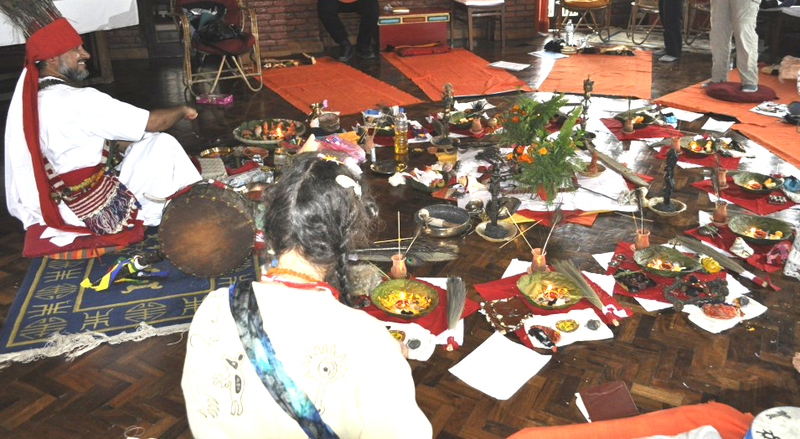 There Bhola had created a BEAUTIFUL ritual room with a central altar, a place, where he as our teacher had his personal altar with drums and his shaman outfit and an personal altar space for each of us in a wide circle around the centre. This is, where we will learn and do work for the next few days. Late in the evening, I went up with my rattle to the roof top garden outside the ritual room and sang and prayed. I called my Miahanits – (also sometimes referred to as “the gang” of Animal Guides), my Ancestor Guardians and the Spirits of Place, of here, of Nepal, of the Varya and the mighty Swayambhunat stupa right across from us on the next hill, shimmering in the soft light. I prayed, to be accepted by the Spirits of this land, as a guest and a seeker, that brings only admiration and respect. I humbly requested, that my Miahanits and my Ancestor Guardians be permitted to come here, to come through and to help me learn. I humbly asked for one of the Spirits of this land to come forth as my guide and teacher……. I prayed, I rattled and I chanted…..
Next morning he first subject of Bhola’s teaching circle is to learn about Dashain, the festival that is right now being celebrated all throughout Nepal. Today is the day, where everyone returns home to receive a tika and a Blessing from the parents and family elders. We light the oil lamps of our altars, then all receive a Blessing from Bhola, a tika out of red coloured yoghurt and Barley grain and we each get a few Barley seedlings for our personal Altar. Then Bhola reads sacred text from the Vedas. The book he reads from is from his grandfather, who also was a shaman…..
like an ancient lake bed. The death bed of an ocean. Then again lakes, like teardrop shaped pock marks in the beige brown matrix. It changes the view into a permanent rainbow! Then a mighty river! 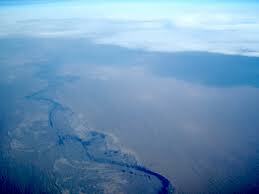 The Amu Darya! Roads, then a large town: Nukus. The mighty snaking River is being swallowed by the rainbow. Then the plane turns again, just a tiny fraction of a degree…. the plane bows down, Russian air space demands it. Hiding beneath a blanket of clouds. Up here – turbulences dipped in sunset gold! Time for dinner and a movie……. I was born in 1966, in the mountain district of Bhojpur, to the south of Mount Everest. At a very young age I was chosen by the spirits of my ancestors to carry their messages and healing traditions. My grandfather, who was a very skilful and well known local shaman, found out that I was going through what I would perhaps call a ‘divine embodiment’ – an intinstive communication with the spirits – and so he tried to help me. One night he performed a special ceremony to find out what was happening inside me, how the contact with the spirits was affecting me and what they wanted from me. Having completed the ceremony, he found out the reason the spirits had chosen me, and so my grandfather started teaching me himself. If you want to be a shaman, having a human teacher as a guide is a must, as human teachers show you the best way to explore and work with the spiritual worlds; and they can teach you how to perform healing rites and rituals as well. Finally, after I had learnt what I needed to learn I was initiated. Back then it was not easy to work as a healer, as I was a young student at the time too, but the process of honouring the spirits continued none the less. I remember my family and the local shamans used to get together during annual ancestral clan-deity festivals, held at our ancestral home. 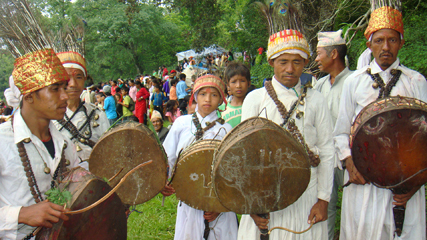 During these ceremonies, clan relatives and members construct a sacred space at the edge of the village including a thatch-roofed spirit house with carved stone figures, representing clan deities, Mother Earth, nagas (serpent spirits) and other spirit beings. All the stone carvings use would be smeared in colourful vermillion and yellow powder (tika). All the people at the festival would make offerings of flowers, fruits, honey, water and milk. The keeper and protector of the animals (Mahadeo), the archtypal forest shaman (Banjhankri) and the hunting spirits of the forest (Sikari) were also given special veneration during this time. Along with my grandfather and other shamans of the clan, I used to make the offerings and sometimes the spirits use to inspire me and speak through me. When the offerings to the spirits were over, everyone used to prepare special rice pudding out of milk they had collected from their homes and rice. But as I grew up more, I found I had began to drift away from my shamanic calling, and I started to feel more and more uneasy and gloomy. Gradually I began to understand that it was because I was suppressing the natural flow of spiritual energies which my spirits were putting into me, and that was making me sick. This made me realise that however busy I was as a student, I had to reconnect with my spirits again, and so I started practising shamanism once more. After graduating from university, I studied alternative medicines. For six years I learnt about and used herbal medicines, combining them with the shamanic practices I had learnt in order to help the needy. When I got reconnected with the helping spirits, everything became very fluid, my clients did not only ask for herbal preparations but spiritual healings also. During this period I travelled extensively to collect rare plants and herbs and also to immerse myself deeply in shamanic practices from different teachers in Nepal, North-east India, Bhutan and parts of Sikkim and Darjeeling. In 1997 I met Mariarosa Genitrini, my wife, in Kathmandu. I met her at the house of a shaman were she had gone to do some interviews. We got married in Kathmandu, and In 1998, I was invited to Italy, and it was then that I started travelling to the West. After this first visit to Italy, my wife and I started organising cultural and shamanic field study tours in Nepal, Tibet and India and I also teach workshops with my wife too. 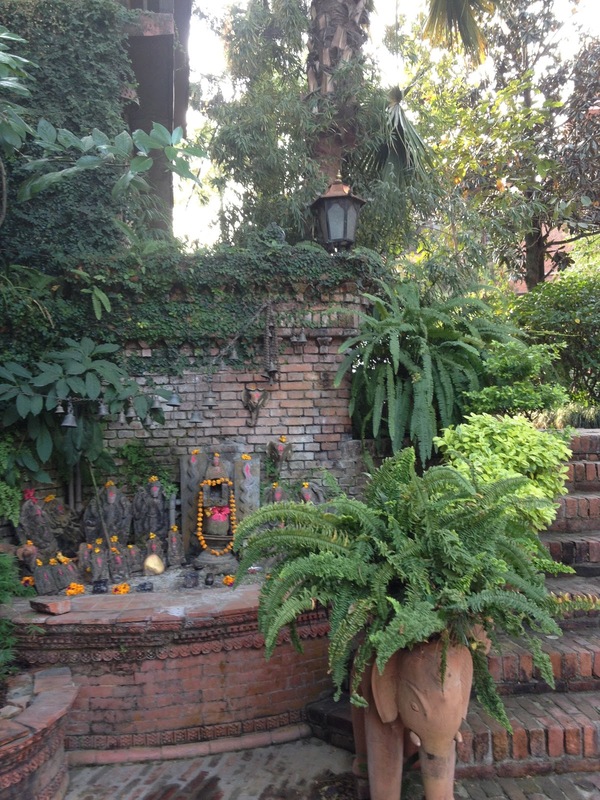 But despite all the traveling, I still feel connected to the ancient ways I learned in Nepal as a child. 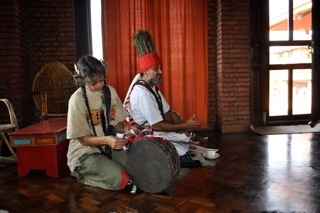 The main event in our journey to Nepal is the Nepali specific shamanic teachings given by shaman and tour guide Bhola Banstola. 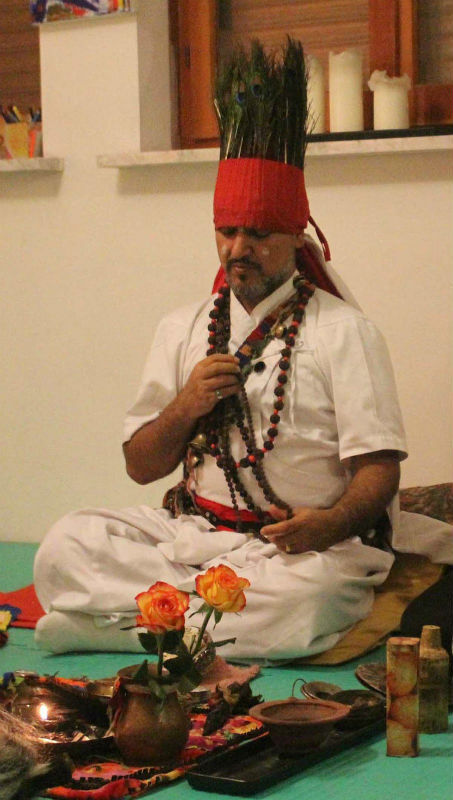 Before I talk about my personal experiences and journeys during our shamanic sessions, I feel it is good to give a little information about Nepali shamans and their healing practices. The tiny country of Nepal lies between India and the Tibetan Autonomous Region of China. Prithivinarayan Shah, the first king of the united Nepal once declared the country to be a “…garden for all types of people” for it is home to more than sixty different ethnic groups. The geography of Nepal is equally diverse ranging from the jungles of Terai in the South to the towering Himalayas in the North. It was not until 1950s, when Nepal’s borders were opened to the West, that foreign scholars become aware of this land’s amazing diversity and mystery. 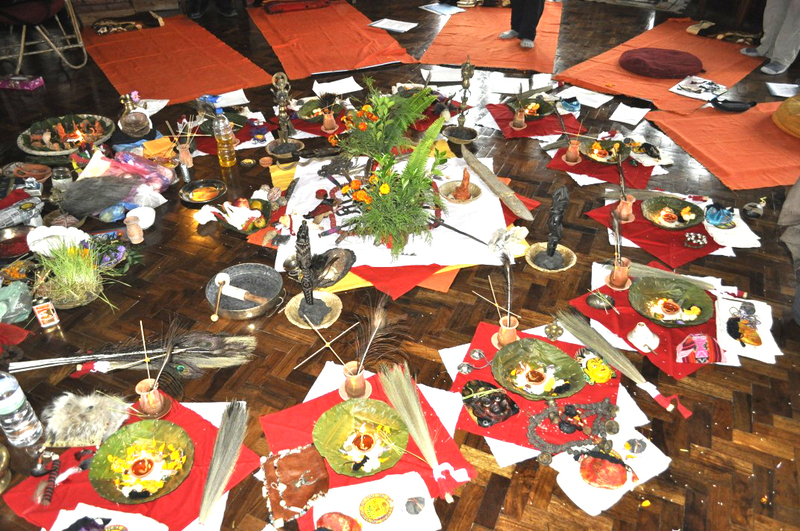 Hinduism, Animism and Buddhism are the major religions practiced in Nepal. 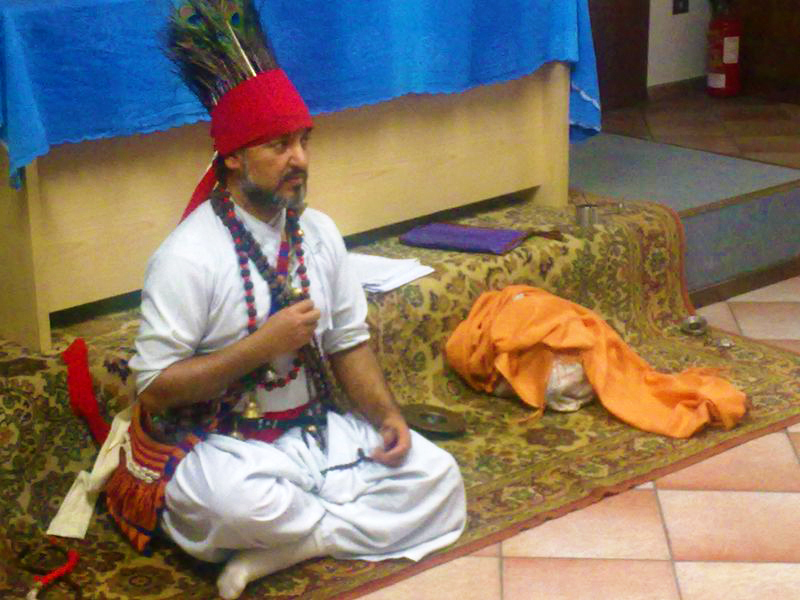 Regardless of their religion, however, the majority of people turn to the Dhami/Jhankri (shamans) for help. The people seek a shaman’s help for physical and emotional healings as well as relying on them to protect their animals and crops from natural calamities. The Nepali concept of health is quite different from that found in other parts of the world. A health issue is not just something that has gone wrong with an individual but can also include difficulties with their relationships with their families, communities and universe. Nepali shamanism is based on an animistic belief that honors Mother earth and respects the spirit that resides in all living beings. This universal worldview is key in preserving the ecology of the land and in bringing harmony and creating healthy alliances with to all things visible and invisible. The role of the Dhami/Jhankri is to reestablish this harmony. Shamans are the central figures in their communities for they are not only healers but also the storytellers, dancers, singers, artists and musicians. They acquire these talents, their spiritual power and wisdom through their personal helping spirits, ancestral deities, elemental spirits and guides. They accomplish their work by voluntarily modifying their state of consciousness in order to perceive what aspects of the person, family or community require rebalancing. In 1962, Prof. A.W. Macdonald attempted to define the Dhami/Jhankri in the following way stating that the shaman is “…a being who goes into trance and at that time voices speak through his body which allow him to diagnose illnesses and sometimes to cure them, to give advice concerningthe future and to calrify present facts in the light of the evidence which took place in the past. He is therefore, at the same time a priviledged intermediary between spirits (which give and cure sicknesses) and men; between the past, present and the future; between life and death and, in another perspective, between the individual and a certain social mythology. He can, it seems, be of any jat (caste) and he can take as pupil, in order to transmite to him his knowledge and his techniques, a person of any jat (caste)”1. In 1966, Macdonald designated the Dhami/Jhankri as the healer who, after having suffered possession by a spirit from outside of his everyday world, manages to control and regulate it. In his 1967 book, People of Nepal, Kathmandu, the Nepali anthropologist Prof. D.B. Bista defined “Jhankrism” as “Shamanism/Animism”. 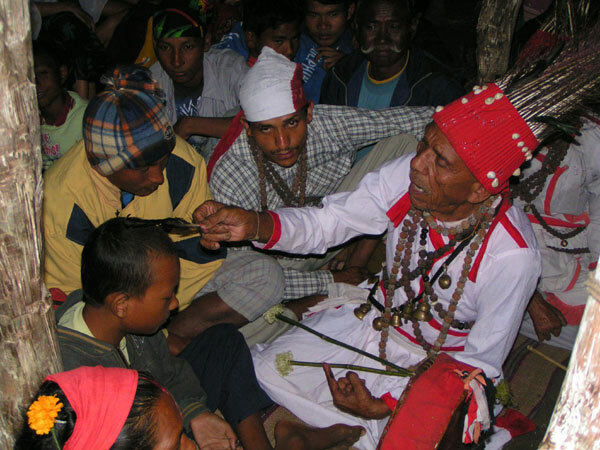 By 1976, publications such as Spirit Possession in the Nepal Himalayas, and testimony by renown anthropologists provided evidence that the Dhami/Jhankri played a similar role as the shaman in other cultures. shamanThe Nepalese shamanic sources of power come from honoring Mother Earth and the spirits of the place where the shaman performs his ceremonies. The shamans must call on the guardian spirits and deities who inspire him; the keepers of the earth, snowclad mountains, trees, rivers, lakes, and medicinal plants. The sacred hidden language of the land is felt in the form of rhythms, vibrations and warm and cool sensations in the physical body. Understanding this language, the shaman has to honor the spirits of the place and ask their permission. If the place is spiritually dead or some malignant spirits have taken over, the shaman must first revive the balance or fill in the gap of what is missing by calling on the spirits of the place. Among most Nepalese people, it is believed that the ‘soul’ never dies but transmigrates from one body to another through many cycles of death and rebirth. The culture believes that while the physical is a gift from our blood relations, the soul we have is directly inherited from our past life experiences. 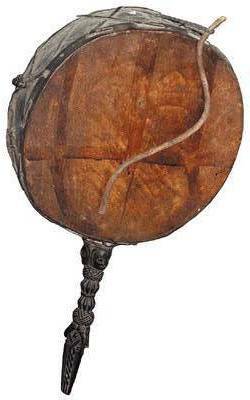 As we are part and parcel of all our ancestors, the ancestral deities are a strong source of power and protection for the Nepalese shaman. Bloodline ancestors from the father’s lineage and milk line ancestors from the mother’s side are equally important. Without the ancestors’ blessings and help, not only are shamanic healings difficult, but loss of equilibrium and imbalances are likely to arise in everyday lives. In research conducted by the university in the late 1970’s it was noted that for every shaman there were 70 people that the shaman cared for, where as a each medical practitioner was responsible for over 27,00 people. This meant that far more people received individualized care by a shaman than could be seen by a medically trained person. Today, thanks to the aggressive introduction of conventional care and religious conversion, far fewer people are seeking the services of shamans that in the past. For instance, due to influences by other traditions, people in Nepal now have more choices when seeking seek spiritual help. Along with shamans, people may consult a Hindu Brahman pandit, a Buddhist lama, a Christian minister or priest, an Islamic spiritual healers(pir) or other spiritual counselor for assistance. This “modern” transition is tragic as human beings are no longer attending to being in harmony. For most of our collective human past, people nurtured very good relationships with nature and all that is created. Our ancestors made offerings, revered their ancestors, honored Mother Earth and understood that caring for the plants and animals was a part of being and living a harmonious life. The result is that many human beings feel fractured, fragmented and disconnected from the Source. The role shamanism can play in healing our collective “Fall from Grace,” is to help restore people to harmony, to mend the tears in the fabric of interrelationships that make and keep us vital, reintroduce individuals to their own preciousness and help people to remember the profound sacredness of nature. In many ways, it is our oldest spiritual connection that holds the biggest hope for a bright future! I will write about it , when I get home! Yesterday we visited the “Monkey Temple Swayambhunath, attended the chanting Bhuddust monks , made offerings of flowers and water to the Earth Goddesses, fed the Monkeys, and watched the Eagles circle overhead. Today we visited Bhaktapur and its sacred sites. Happy Full Moon Greetings from Kathmandu!